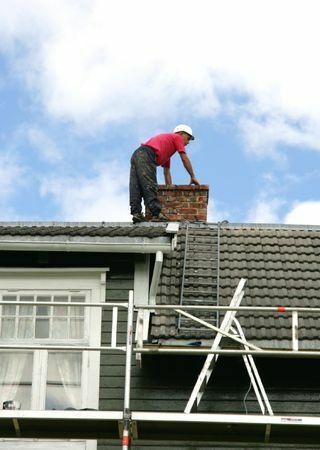 When is the last time you had your chimney checked by a professional? For most people it has been “a while.” What are some key reasons to have your chimney looked at? First, consider this: over time cracks may occur in your chimney’s flue, which is the inside liner of the chimney unit. The flue normally carries heat, smoke and toxic fumes up and out of your house. If there are cracks in the flue, guess where all that’s going to end up? In a nutshell, it won’t be a good thing! Meanwhile, sometimes the flue cap at the top goes missing or gets damaged. When that happens, water drips down into the flue and this can cause it to deteriorate– again, not good. Speaking of cracks, sometimes cracks develop in the masonry that’s essentially “holding it up.” Brick chimneys’ masonry should be checked periodically in order to ensure there aren’t any cracks that could cause the whole thing to fall down. Furthermore, a chimney’s damper should be checked, too, to make sure it’s able to open and close properly. Did you know animals like squirrels and raccoons often like to find their way into chimneys and make a nest? Obviously, their nests should be removed before you decide to light a fire. A professional can check to see if any animals have burrowed into parts of your chimney unit. Bruce’s Chimney Service of East Stroudsburg, PA, does chimney cleaning as well as chimney repair. Would you like an experienced contractor to come talk a look at your chimney to make sure it’s in good working order? Please schedule an appointment. Bruce’s Chimney Service offers digital evaluations and can then do relinings, repointings, and flashing/flue repair as necessary. For more information, please call 570-424-7250 or email info@brucescentral.com.